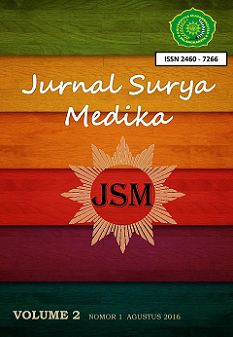 Welcome to the Journal of Universitas Muhammadiyah Palangkaraya, contains journals published by institutions within Universitas Muhammadiyah Palangkaraya. This digital collection is a revised version of various journals that have been published in printed releases and multiple research articles and scientific studies covering various scientific fields such as education, engineering, forestry, administrative sciences, law, social politics, health sciences, and various other areas. It was first published in August 2018 using Open Journal System (OJS) 3.1. Since November 2018, All Journals from Universitas Muhammadiyah Palangkaraya has a DOI Prefix from Crossref with a prefix of 10.33084, the result of the collaboration with Relawan Jurnal Indonesia. 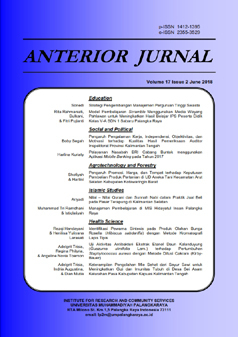 Anterior Jurnal is a Scientific Journal managed by Institute for Researches and Community Services Universitas Muhammadiyah Palangkaraya and published twice a year (in June and December) by Institute for Researches and Community Services Universitas Muhammadiyah Palangkaraya. Anterior Jurnal contains articles of research and critical-analysis studies in Humaniora and Social Sciences topics including Education, Economic, Guidance and Counseling, Social, Political, Islamic Studies, and all related issues. Anterior J is accredited at "SINTA 4" until December 2020 by Ministry of Research, Technology and Higher Education, Indonesia No: 30/E/KPT/2018. 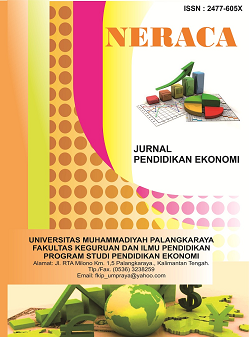 Pedagogik: Jurnal Pendidikan is a Scientific Journal managed by Faculty of Teacher Training and Education Universitas Muhammadiyah Palangkaraya and published twice a year (in March and September) by Institute for Researches and Community Services Universitas Muhammadiyah Palangkaraya. 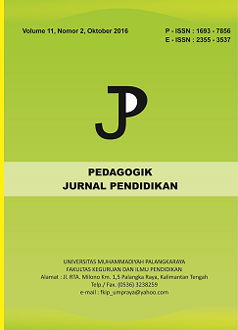 Pedagogik: Jurnal Pendidikan contains articles of research and critical-analysis studies in General Education topics, including elementary teacher education, economic education, guidance and counseling, and information technology education. Neraca: Jurnal Pendidikan Ekonomi is a Scientific Journal managed by Department of Economic Education Faculty of Teacher Training and Education Universitas Muhammadiyah Palangkaraya and published twice a year (in March and September) by Institute for Researches and Community Services Universitas Muhammadiyah Palangkaraya, contains articles of research and critical-analysis studies in Economic Education topics. 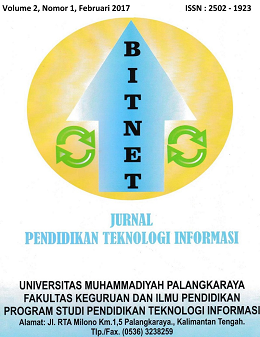 Bitnet: Jurnal Pendidikan Teknologi Informasi is a Scientific Journal managed by Department of Information Technology Education Faculty of Teacher Training and Education Universitas Muhammadiyah Palangkaraya and published twice a year (in March and September) by Institute for Researches and Community Services Universitas Muhammadiyah Palangkaraya, contains articles of research and critical-analysis studies in Information Technology Education topics. Restorica: Jurnal Ilmiah Ilmu Administrasi Negara dan Ilmu Komunikasi is a Scientific Journal managed by Faculty of Social and Political Science Universitas Muhammadiyah Palangkaraya and published twice a year (in March and September) by Institute for Researches and Community Services Universitas Muhammadiyah Palangkaraya, contains articles of research and critical-analysis studies in Public Administration and Communication Science topics. Pencerah Publik is a Scientific Journal managed by Faculty of Social and Political Science Universitas Muhammadiyah Palangkaraya and published twice a year (in March and September) by Institute for Researches and Community Services Universitas Muhammadiyah Palangkaraya, contains articles of research and critical-analysis studies in Social and Political Science topics. 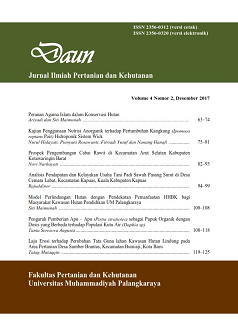 Daun: Jurnal Ilmiah Pertanian dan Kehutanan is a Scientific Journal managed by Faculty of Agriculture and Forestry Universitas Muhammadiyah Palangkaraya and published twice a year (in June and December) by Institute for Researches and Community Services Universitas Muhammadiyah Palangkaraya, contains articles of research and critical-analysis studies in Agrotechnology, Forestry, Fisheries, and another related topics. Daun J Pertanian Kehutanan is accredited at "SINTA 5" until December 2020 by Ministry of Research, Technology and Higher Education, Indonesia No: 30/E/KPT/2018. Jurnal Hadratul Madaniyah is a Scientific Journal managed by Faculty of Islamic Studies Universitas Muhammadiyah Palangkaraya and published twice a year (in June and December) by Institute for Researches and Community Services Universitas Muhammadiyah Palangkaraya, contains articles of research and critical-analysis studies in Islamic Studies, Al Ahwal Al Syakhsiyah (Islamic Law), Madrasah Ibtidaiyah Education, and another field related. Media Ilmiah Teknik Sipil is a Scientific Journal managed by Department of Civil Engineering Faculty of Engineering Universitas Muhammadiyah Palangkaraya and published twice a year (in February and August) by Institute for Researches and Community Services Universitas Muhammadiyah Palangkaraya, contains articles of research and critical-analysis studies in civil engineering related topics. Media Teknik Sipil is accredited at "SINTA 5" until December 2020 by Ministry of Research, Technology and Higher Education, Indonesia No: 30/E/KPT/2018. 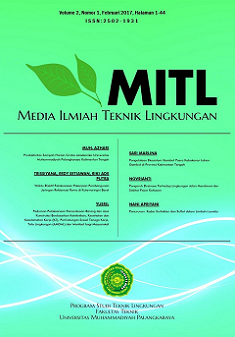 Media Ilmiah Teknik Lingkungan (MITL) is a Scientific Journal managed by Department of Environmental Engineering Faculty of Engineering Universitas Muhammadiyah Palangkaraya and published twice a year (in February and August) by Institute for Researches and Community Services Universitas Muhammadiyah Palangkaraya, contains articles of research and critical-analysis studies in environmental and environmental-based construction engineering. 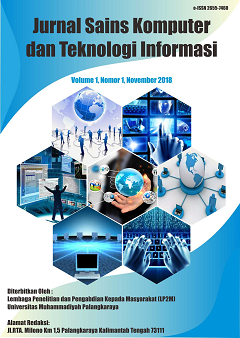 Jurnal Sains Komputer dan Teknologi Informasi (ISSN: 2655-7460 (online)) is a Scientific Journal managed by Department of Computer Science Faculty of Engineering Universitas Muhammadiyah Palangkaraya and published twice a year (in February and August) by Institute for Researches and Community Services Universitas Muhammadiyah Palangkaraya, contains articles of research and critical-analysis studies in computer science related topics. Jurnal Surya Medika (JSM) is accredited at "SINTA 4" until August 2021 by Ministry of Research, Technology and Higher Education, Indonesia No: 10/E/KPT/2019. 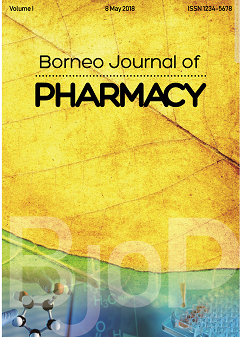 Borneo Journal of Pharmacy is a Scientific Journal managed by Department of Pharmacy Faculty of Health Science Universitas Muhammadiyah Palangkaraya and published twice a year (in May and November) by Institute for Researches and Community Services Universitas Muhammadiyah Palangkaraya, contains articles of research and critical-analysis studies in Pharmacology-Toxicology, Pharmacognosy-Phytochemistry, Pharmaceutical, Analytical Pharmacy-Medicinal Chemistry, Microbiology Pharmacy, Natural Product Development, Clinical-Community Pharmacy, Management Pharmacy, and other Pharmacy aspects. 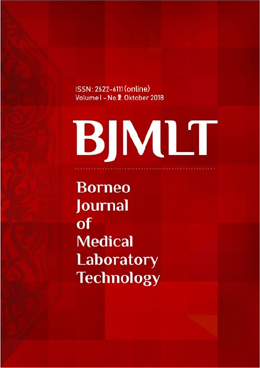 Borneo Journal of Medical Laboratory Technology is a Scientific Journal managed by Department of Medical Laboratory Technology Faculty of Health Science Universitas Muhammadiyah Palangkaraya and published twice a year (in October and April) by Institute for Researches and Community Services Universitas Muhammadiyah Palangkaraya, contains articles of research and critical-analysis studies in Blood-transfusion Science, Clinical Chemistry, Hematology, Histopathology, Immunology, Microbiology, Parasitology, Toxicology, Food and drink Analysis, Molecular Biology, and other Medical Laboratory aspects. 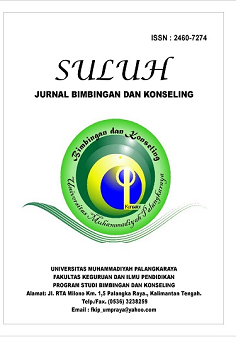 Journal of Universitas Muhammadiyah Palangkaraya is published by Institute for Research and Community Services Universitas Muhammadiyah Palangkaraya and licensed under a Creative Commons Attribution-ShareAlike 4.0 International License.